Remove rivet at each top corner of fan shroud. Pry out rivet center pin (tack lifter), then fully pry out rivet from base (tack lifter). Remove fan, belt static friction method. Remove fan / fan clutch from water pump shaft. Place open wrench on fan clutch nut (32mm combo wrench). 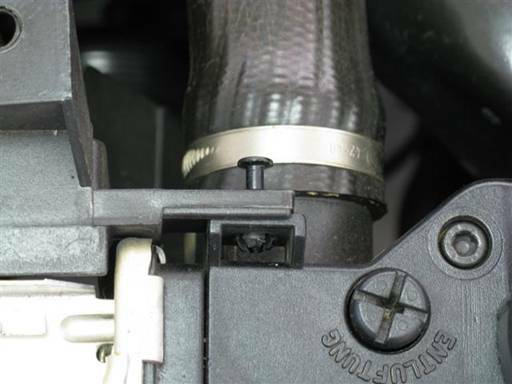 Place wrench forward on nut to avoid hitting vanos body and radiator hose clamps. 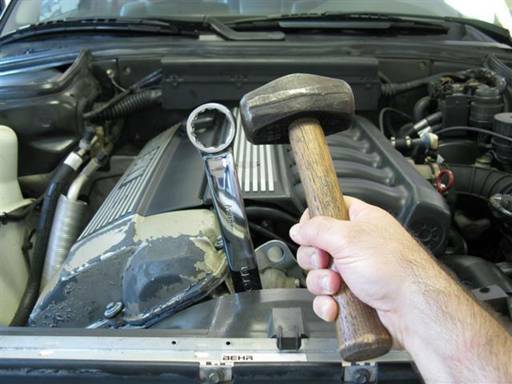 Strongly strike wrench side at top with heavy hammer to break nut seize (sledge hammer); left hand thread. Note: Nut is left hand thread, thus unscrew by hitting wrench top from left to right (car front orientation). 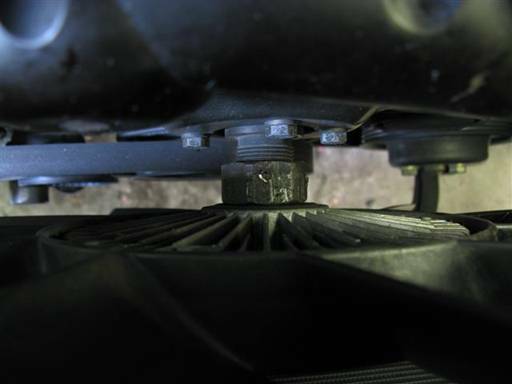 Serpentine belt static friction on water pump pulley facilitates large enough opposing force to break nut seize. It is important to use a heavy hammer to produce a high instantaneous jerk. Several attempts will be needed before nut seize breaks. Rotate open wrench to reposition for better access. If belt static friction method is not successful, attempt pulley holding tool method. 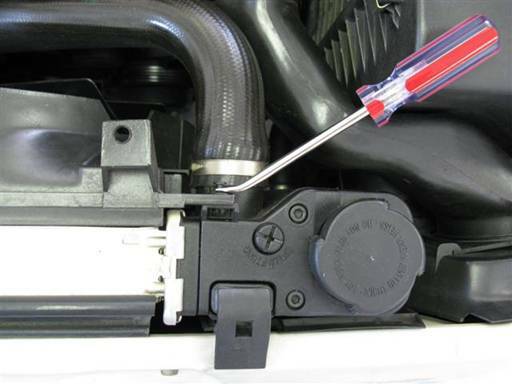 Remove fan, pulley holding tool method. Position water pump pulley for holding tool access. Water pump pulley has 2 (adjacent) pairs of mounting bolts. Position one of the bolt pairs with left bolt at just to right of top center (picture) (32mm combo wrench). Install water pump pulley holding tool onto pulley bolts. 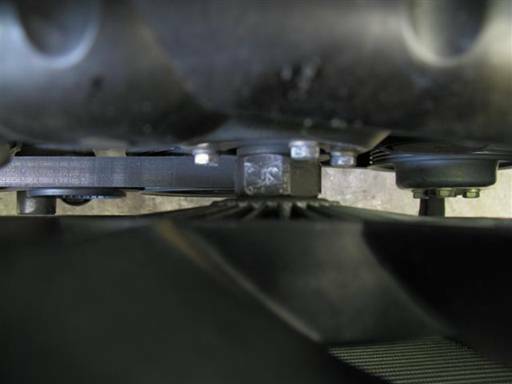 Position holding tool at right, and place tool indent curve against fan clutch nut. Mount tool end hole onto pulley bottom left bolt, and tool second hole onto pulley right bolt. Reposition fan clutch nut for better holding tool access (picture). Place open wrench on fan clutch nut (32mm combo wrench). Counter hold holding tool and break clutch nut seize (32mm combo wrench); left hand thread. Note: Nut is left hand thread, thus unscrew by turning wrench from left to right (car front orientation). If fan clutch nut seize difficult to break, apply lubricant to nut/threads contact surfaces (spray lubricant). Once nut seize is broken, remove tools and spin fan blades to unscrew nut; left hand thread. When nut is close to shaft end, turn fan slowly while continuously holding fan blades. This will keep fan from falling and damaging radiator fins when fully disconnected. 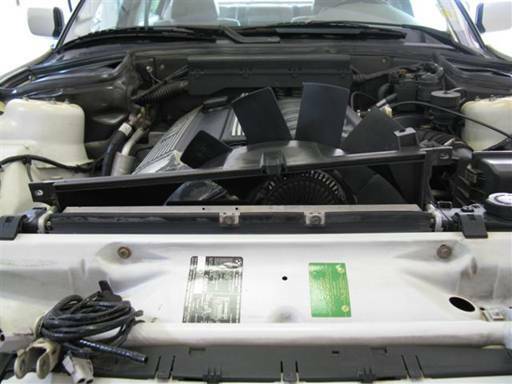 Lift fan shroud up while maneuvering fan / fan clutch out of fan shroud and engine bay. 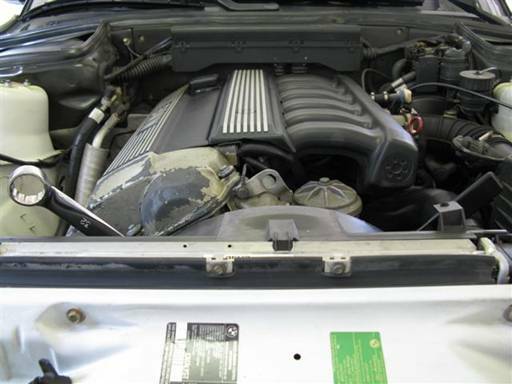 Remove fan shroud from engine bay. Tilt shroud right side up and slide shroud into position. Align shroud by pulling up, forward, and dropping into position. Insert fan/clutch in fan shroud. Lift fan shroud up and forward while maneuvering fan/clutch into fan shroud. 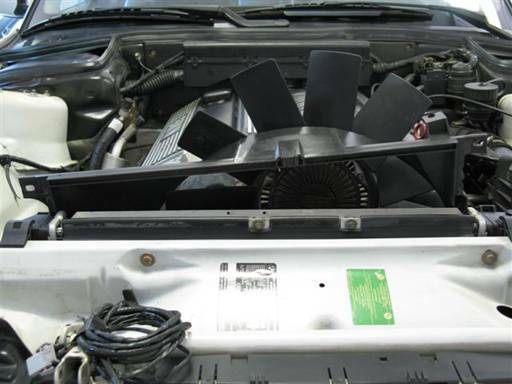 Note: Fan is oriented with clutch nut to car rear. Align shroud by pulling up, forward, and dropping down into lower frame slots. Mount fan/clutch onto water pump shaft. Lift fan and mate (hang) fan clutch nut onto water pump shaft. Rotate fan to find best nut thread to shaft thread mate. At optimal fit, fan will hang on shaft without threading (picture). With fan hanging independently on shaft, slowly turn fan blades to thread nut onto shaft; left hand thread. Fully thread nut onto shaft. 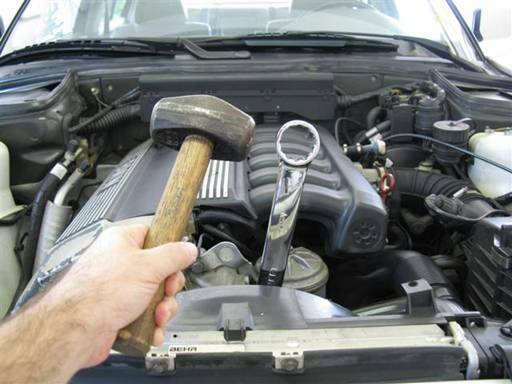 Place open wrench on fan clutch nut (32mm combo wrench) and lightly hit wrench top with heavy hammer, one time; left hand thread (sledge hammer). Note: Serpentine belt static friction on water pump pulley facilitates large enough opposing force to tighten clutch nut. Fan opposing spin also tightens fan clutch nut. Fully install fan shroud. Lift fan shroud up, pull forward, and drop down to mount into lower frame slots. Note: Fan shroud should insert fully and align with car frame. Install rivet at each top corner of fan shroud. Pry rivet center pin out, fully insert rivet base into shroud, then press in rivet center pin.